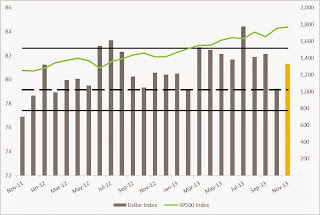 Dollar Index gaining traction as the S&P 500 continues to climb higher following the November, 2013 Job Report numbers. The Dollar Index two year return % back in the black positive ~5.71% while the S&P 500 is up ~41.28%. Technical Outlook: Dollar remains vulnerable to the downside. A move below 79 could trigger a technical sell-off.